Demonstrators rally at the Chinese Consulate at the financial district of Makati city, The Philippines, to protest China's reclamations of disputed islands off South China Sea, July 3, 2015. The reclamations have strained U.S.-China relations. China’s perceived aggressive policies in its neighboring waters and in cyberspace are two of the biggest roadblocks in its relations with the United States, according to a high-ranking Obama administration official and an influential congressional leader. U.S. Deputy National Security Adviser Ben Rhodes and Republican Senator Lindsey Graham, a 2016 presidential contender, both spoke this week on China at the Aspen Ideas Festival. That annual gathering in Aspen, Colorado, attracts leaders from around the globe and from many disciplines for discussions of ideas and issues. Rhodes said the United States and China are more interdependent than people think, despite areas of real difference on human rights and other issues. "Even though we had those differences, we would suffer mightily from a conflict," Rhodes said. "What we’ve tried to do with the Chinese over the years is to say, essentially, ‘Let’s identify the issues [where] we can work together,’ and we've tried to move them into being a more assertive and responsible global actor." FILE - White House Deputy National Security advisor Ben Rhodes speaks to reporters during a press briefing in Edgartown, Massachusetts, Aug. 22, 2014. Climate change is the focal point of that effort right now, the presidential adviser said, following the "strategic dialogue" meetings in Washington last week between senior officials from the two countries. Also, he added, "You can't solve that problem without the Chinese." Rhodes said cybersecurity is a perennial point of potential friction between the U.S. and China. "We see China moving into cyberspace where they're stealing, not just conducting espionage, but again intellectual property and things that make it difficult for U.S. businesses," Rhodes said. "The case we make there is, 'You are creating an environment that is ultimately harmful to you, because U.S. businesses need to have confidence that they can invest and act in China without their trade secrets being taken away,' " he said. 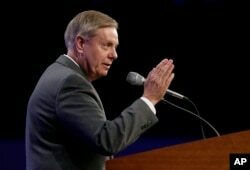 Graham said China and Russia are not helping the United States in world affairs. "Do you think China's infringing on resource-rich waters claimed by others is a helpful thing?" he asked. "I don't see China and Russia helping. I wish they would." Since China has been involved in territorial disputes with its Asian neighbors for decades over islands in the South China Sea, Rhodes said the U.S. strategy is to work together with Asian countries to establish a rule-based order in the Asia-Pacific region. "If we have other countries invested in that type of rule-based order – not just India, but ASEAN countries, Australia, Japan, Korea – ultimately we want that to be an incentive ... for China to play by those rules." That policy currently faces a big test in the South China Sea, where, Rhodes said, "We see very assertive Chinese activity that, frankly, is potentially destabilizing." For the United States, working to establish order and rules guiding all nations' conduct means "not just going directly to the Chinese and complaining [or] having our own military exercises to demonstrate our commitment to the freedom of navigation," Rhodes said. "It's working with the other countries in the region," he added, "to get them in a common space around how are we going to solve these problems consistent with international law, because it will be much harder for one big country to bully a smaller one if those countries are taking common positions." Sen. Lindsey Graham, R-S.C., speaks during the Iowa Republican Party's Lincoln Dinner, May 16, 2015, in Des Moines, Iowa. Graham said territorial disputes and cybersecurity are opportunities to send China a clear, tough message: "I want to trade with you, but if you keep taking property that doesn't belong to you, by force or threat or force of arms, we're going to have a different trading relationship; if you keep hacking into our systems and cyber-attacking our nations, we are going to treat you not as a friend but as an adversary." 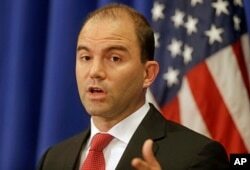 The South Carolina lawmaker said China must choose what sort of relationship it wants with the United States. "If you want to be a friend, our doors are open," he said. "If you want to fight, then we are going to fight." This year’s Aspen Ideas Festival runs through Saturday, the U.S. Independence Day holiday that celebrates the nation's birth 239 years ago.